Researchers at the Center for Plant Aging Research, within the Institute for Basic Science (IBS), have discovered that a three protein hub – dubbed NAC troika—controls the onset of leaf old age. Their systematic study, published on Proceedings of the National Academy of Sciences of the United States of America (PNAS), describes protein networks that change during the plant lifespan and play a role in aging. Yellowing of leaves is only one of the most evident signs of plant senescence—the late stage of aging which involves a sophisticated process with thousands of genes, as well as a large number of physiological, biochemical and metabolic changes. These are controlled by several different proteins that evolve during the plant life to either promote or hinder aging. Among all the molecules that take part in the aging process, one of the largest and most important protein groups is called NAC. Technically known as transcription factors, NAC proteins are able to finely regulate the expression of other NACs and other age-related proteins. IBS researchers have identified which NAC proteins are the most influential at different stages of plant aging. The research team used Arabidopsis thaliana plants, each lacking one of 49 selected NAC proteins, and measured the effects on other NACs. Depending on which NAC protein was missing, other NACs may be more or less expressed in the leaves of 14, 18, 22 and 26-day- old plants. Arabidopsis has a rapid life cycle of about 6-8 weeks from germination to seed production: it is mature at day 14, and displays more than 40% chlorophyll loss at day 26. Compared to a person, the plant would be similar to a 30-year-old at day 14, and starting to save for retirement at day 26. Interestingly, the scientists detected a clear change between the 14th and the 18th day: a remarkable sign of passage from adulthood to senescence. 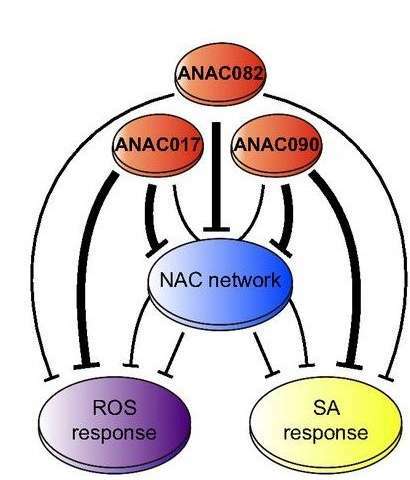 In 14-day-old leaves, the deprivation of the individual NACs mainly reduce the expression levels of other NACs, but their relationships flip in the 18-day-old leaves. The researchers found that three NAC proteins (ANAC017, ANAC082 and ANAC090) play a major role in this inversion: the NAC troika hinders aging before day 18, and then it lets it happen. When all the three troika proteins are working, aging is timely regulated, but if just one is missing, plants age earlier than normal. A total of 1,977, 1,355 and 1,907 genes are differentially expressed in plants lacking ANAC017, ANAC082 and ANAC090, respectively. Among these, more than 1,500 genes are related to aging and leaf senescence. Plants missing one or more NACs show impairment in their chlorophyll content and photosynthesis. As a consequence, yellowing of the leaves, which is a senescence symptom related to chlorophyll breakdown, also occurs earlier. The NAC troika also inhibits other two top senescence-promoting molecular pathways. In particular, it stops plant hormone salicylic acid (chemically similar to the active component of aspirin) and oxygen free radicals from building up before senescence. It is known that increase in the concentration of salicylic acid induces expression of senescence-associated genes (e.g. SAG12) involved in cell death. The team found that ANAC090 controls several genes related to the accumulation of salicylic acid, and ANAC017 to oxygen free radicals. "A troika can be a Russian vehicle pulled by three horses, or a political organization with three leaders. We chose this term 'troika' to represent both meanings," says PARK Ji Hwan, first co-author of the study. "The deprivation of the three NACs leads to the same result; early senescence, like a Russian troika where all the horses ride in the same direction. On the other hand, each NAC has also its own specific function, for example ANAC017 and ANAC090 predominantly suppress salicylic acid and free radicals responses, respectively. For this reason, it can also be thought as a political troika, in which three leaders govern different parts of a political system." "Leaf aging is controlled by a dynamic organization of protein networks that changes over time. During the adulthood of leaves, until day 18, a leaf hinders the onset of senescence to serve its own role: production of energy by photosynthetic process. Then the leaf decides its fate. The three NACs, that we dubbed NAC troika, work like a hub that coordinates the timely activation and inhibition of several other proteins," explains HWANG Daehee, one of the leading authors of this study. "In other words, the NAC troika suppresses leaf aging, until it is the right time. And the rite of passage between day 14 and 18 becomes the landmark of leaf senescence." In summary, IBS scientists could pinpoint new senescence regulators, such as ANAC090, and describe a possible correlation between NACs, salicylic acid and free radicals. In the future, this approach could be useful for studying other plant transcription factor families, beyond NACs. Animals do molting, lose antlers etc., This is different. If they can revert leaf in the process of aging, it will be a big boost to science !